@curryja How did that "insurance" work out? The so called ozone hole continues to expand and contract quasi-periodically as before treaty. A minor historical note. Gavin and Tim Osborne had a side discussion about whether this was absolute or an anomaly. It is absolute. The first TOMS was launched in late 1978. 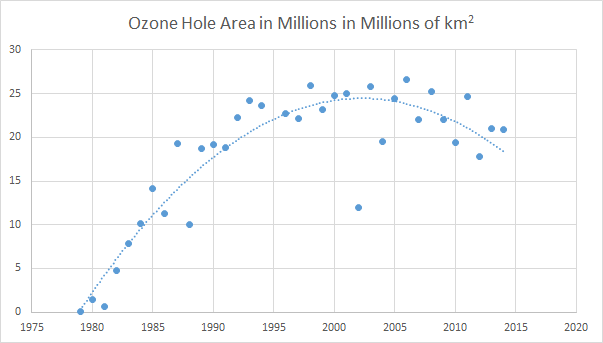 The ozone hole was first noticed from ground observations in 1984 by Farman, Gardiner and Shanklin of the British Antarctic Survey, at which point the TOMS team went back and looked at the data from 1979 on. 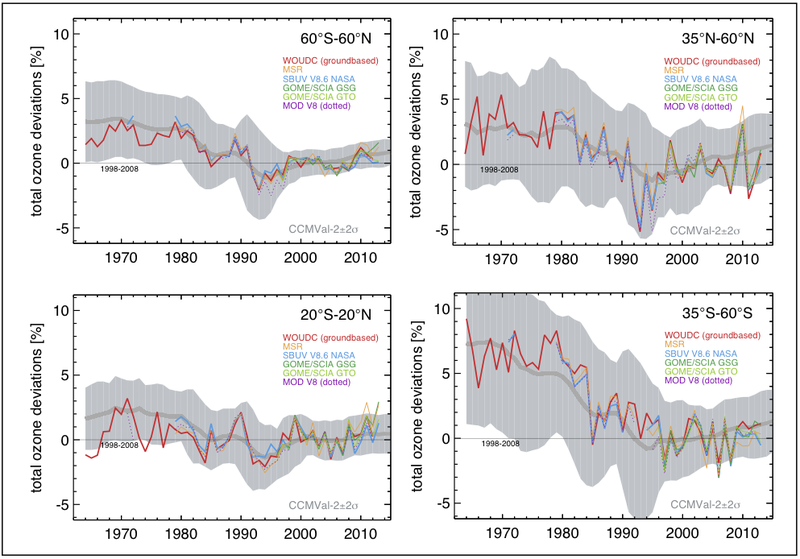 As can be seen in the figure, the first three years, 1979, 1980 and 1981 are pretty consistent, it is only in 1982 that the hole appears for the first time. 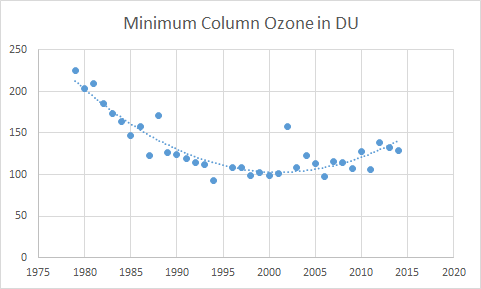 The ozone column depth shows the same story. As Tim Osborne points out, this leads to the definition of a "normal" Antarctic Spring ozone column being 220 DU (Doppler Dobson units, another story). showing that the polar ozone is recovering. Eli, being Eli, pointed out that this meant that the Montreal Protocol Insurance Co. was doing a fine job. The Montreal Protocols have lead to a decrease of chlorine and bromine species in the atmosphere which has in turn lead to an increase in stratospheric ozone, but in addition, the increase in greenhouse gases, principally CO2 is cooling the stratosphere and this slows up the catalytic conversion of ozone by chlorine and bromine, also resulting in higher ozone. The most essential use of ozone depleting chemicals was for refrigeration. There was about $1 worth of CFC in the average fridge at the time. Substitutes were said to be certain to be more expensive, simply because it would take more steps to fabricate them. So, like maybe $4 worth might be required. They had to retool a bit to make refrigerators that would work with refrigerants that wouldn't accelerate the transport of chlorine into the ozone layer when the fridges were junked, but basically, if anyone is wondering why civilization bought into the Montreal Protocol, you don't have to look much further than the fact that the cost was so trivial. The ozone hole surprised everyone studying the situation. Farman observed it for years before he got up the gumption to publish - he knew NASA had the area under observation and they had published nothing. He feared there was something wrong with his data. The consensus picture, pre ozone hole discovery, was that ozone depletion was going to be a bad thing one day, but there was no agreement that any actual damage had been observed anywhere. The reason Farman saw the ozone hole before NASA was because readings that low were assumed to be in error by whoever set up the program to process the NASA data, so humans didn't see the NASA observation until Farman published and they reprocessed their archived data. The chemistry responsible for the sudden reaction where half the ozone over an entire continent disappeared in a few weeks had not been considered possible until it was observed. Researchers were especially uncomfortable when they discovered that at some elevations all ozone was gone. The theorists didn't believe there was ice in the stratosphere anywhere, notwithstanding reports from Antarctic explorers about unique very high clouds, so chemistry involving ice particles was not included in any models. The consensus went from damage to the ozone layer had yet to be observed to suddenly there is a continent sized hole in it big enough to be seen from Mars. I'm not sure what an equivalent climate event might be - a category 6 hurricane obliterating a major city maybe, or a regional drought that transforms something like the US Southwest into something resembling the Sahara. So you had semi hysteria among the best scientists studying the situation, and the fact that a solution was relatively cheap. You could bring the CEOs of all the companies in the world that made the offending chemicals into a room. I thought it was also significant that this was the first confirmed planetary scale damage caused by the wastes of civilization. You must mean Dobson units, not "Doppler units." No doubt the older Rabetts will remember the lack of enthusiasm shown by DuPont and Reagan over taking out insurance. Familiar names like Singer were active then and politicians voiced the opinion that a peer-reviewed consensus was evidence of scientists writing the conclusions before doing the experiments. This is not to deny considerable turf building by the Protocol guys, who willl have to tear my Halon boat fire extinguisher from my unblistered third degree burn free hands . Anybody have news on the HCFC air con efficiency versus greenhouse/methusaleh potential conundrum ? I'll be darned, did you notice the correlation between the beginning of O3 concentration and the eerie period of subdued warming we are experiencing? What's the change in energy reaching the surface versus change in ozone concentration? Russell, one thing I really like you is your imitation of an ivory tower dude with a patronizing attitude. So let's go back to the question. Did you notice the correlated trends? And please don't answer with more banalities about IPCC models. Those don't work very well in short term and medium term projections. @izenmeme: the "Personal Protection" Plan did not come from mainstream of the Reagan Administration, it was Interior Secretary Donald Hodel's last-ditch effort to scuttle the Montreal Protocol negotiations, which had been in progress for two years under the auspices of George Schultz' State Department. Reagan rejected Hodel's plan and supported Schultz. It's hard to remember how little opposition there was to CFC regulation in the late 1980s. There was a huge amount in the 1970s (that's where most of the anecdotes in the wunderground article come from) but by 1985 it had quieted down. The Vienna Convention was signed in March 1985, before the Ozone Hole results were published; the Montreal Protocol was signed in September 1987 and ratified in the U.S. Senate, by a vote of 83-0, in March 1988. Ozone depletion rejection was relegated to such obscure venues as the LaRouchies, Petr Beckmann's _Access to Energy_,and crank science fiction writers like James Hogan. (There is a lot of overlap between these people and the folks who thought Reagan had gone all wobbly against the Soviets by negotiating with Gorbachev.) It emerged from those caverns in 1991/92 via Dixy Lee Ray and Rush Limbaugh, but wasn't taken on by major players in the GOP until 1994 (and then only briefly). Fernando needs to read up on the differences between the effects of stratospheric and tropospheric ozone. Either that or stop smoking those funny cigarettes. Speaking of ozone, did you notice Japan's big jump in ozone-depleting chemicals following the big quake and tsunami? I wonder how many coastlines the tsunami from that will reach?